ETP-CLASSIC is used in a wide variety of applications to fix hubs, cams, gears and sprockets to shafts. The connection is steplessly adjustable, both radially and axially, and backlash free. ETP-CLASSIC suits shafts from 15 to 100mm. 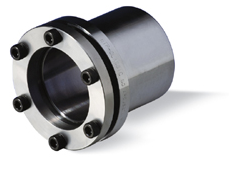 ETP-CLASSIC consists of a double walled, hardened steel sleeve (filled with a pressure medium), a seal, a piston and a flange with retaining screws. When the screws are tightened, the sleeve expands evenly along the shaft and hub and creates a secure connection. After the screws are slackened, the sleeve returns to its original dimensions and can be easily removed. Compact installation dimensions and moderate surface pressure allow small outside hub diameter. Precise hub setting can be carried out during assembly. Low screw-tightening torque and few screws allow the simplest assembly. ETP-CLASSIC is equipped with socket screws, however hexagon bolts are also available as accessories. The best shopping cart software by ShopFactory powers D493. All-in one eCommerce software and shopping cart.